If this happens we have options (i.e. retry for a limited amount of goes and then put the message into an error queue) however we don’t always have the option of using a reliable/durable/transactional transport layer such as messaging, for instance if we are integrating with a 3rd party over the internet they are going to provide usually a HTTP based transport layer such as SOAP/REST or like in my case recently integrating with an internal legacy system that only provides a HTTP transport layer (SOAP webservices was the only option in my case). This post will demonstrate how we can work with services exposed on unreliable transport layer to perform actions but still not end up with duplicates by making the operations idempotent. If I call this multiple times like this DebitAccount("12345678", 100.00m) the client of that account is going to be more out of pocket each time a call is made. How does this relate to my webservice method? Once you get network issues this is where everything goes wrong, this may not be a big deal you may decide to retry the call and the user ends up with another SMS sent to their mobile however if you’re performing a journal on an account this is a big problem. 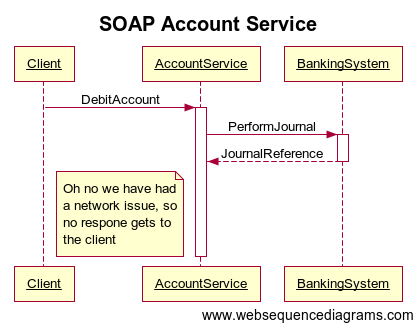 Now we have a problem because the client has no way of knowing whether the debit was performed or not, in the example above the journal has taken place but the machine running the account service could have a problem and not get round to telling the banking system to perform a journal. We established in the last section that the client has no way of knowing whether the debit took place if we do not receive a response from the account service so the only thing we can do would be assume that it did not take place and retry the service call given the scenario from fig 2 this would be very bad as the debit did take place so we would duplicate the debiting of the account. Have the client send something unique (i.e. 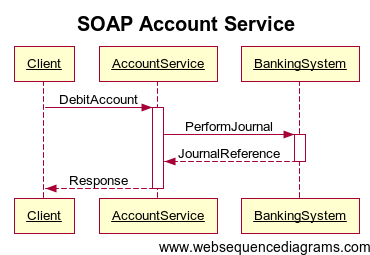 GUID) for the current debit that you want to take place this can then be used by the account service to check if we have already performed the journal associated with this request. The last 2 options are to make the account service idempotent my recommendation would be to use the last option and this is the option I will demonstrate for the rest of the post. Ok so the first change we should make is to add a unique id to the request that gets sent, it is the responsibility of the client application to associate this unique id with the UoW being carried out (i.e. if the client application was allowing an overdrawn account be settled then the UoW would be a settlement and we can then associate this id to the settlement) so the client needs be changed to store this unique id. The next change is for the account service to perform a check to make sure that we have not already performed a journal for the id passed to it, this is accomplished by storing each id against the result (in this case the journal reference) once the journal has taken place and querying it as the first task, if we find the id then we simply return the journal reference in the response back to the client. 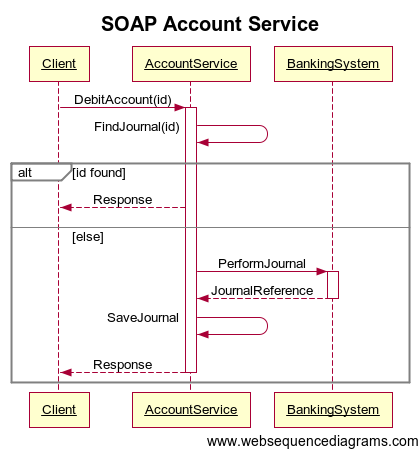 If the id is not found we must not have performed a journal so we need to make the call to the banking system as we were before and then store away the id and the journal reference and return the response back to the client. Ah the joys of distributed architecture! As you can see it still requires the caller to look after the connection so that it can manage it properly and make sure that it is closed however now using the dynamic keyword we can make calls to properties that don’t exist but instead are resolved dynamically and treated as a SqlParameter using the name of the property as the name of the parameter and the value is used as the parameter value, also nulls are automatically converted to DBNull.Value as the value for the parameter. I have added the standard Execute methods that you find on SqlCommand There are also times were you need to add a parameter explicitly for instance for output parameters and if you want more control over the configuration of the parameter in this case I have added an explicit AddParameter for these cases. Tired with writing monotonous & repetitive mapping code, wish their was an easier way to map object A to object B, well look no further, introducing the Lightweight Object to Object Mapper. The Lightweight Object to Object Mapper is designed to make object mapping a doddle! By employing the latest techniques in convention over configuration reduced coding is guaranteed and for those tricky to reach places explicit property mapping can be achieved with minimal effort and fuss. So don’t lose out, download Lightweight Object Mapper right now and start enjoying object to object mapping, but that’s not all for a limited time period if you download the Lightweight Object to Object Mapper you will receive accompanying unit tests… so don’t delay download now! You could also leverage a IoC container here instead. That way users of the logging objects can be notified if logging has taken place but a log factory has not been hooked up. There are times were you want to be able install multiple instances of the same windows service onto the same server (i.e. to support different environments but you have limited servers at your diposal) this poses a problem, you are probably aware windows will not allow more than 1 windows service to be installed with the same service name and when you create a windows service project and an installer you assign the service name at design time. In this instance I have made the servicename argument optional in which case it will use the default assigned at design time, you could enforce it in your version. One thing that suprises me is how hidden this implementation is, most results bring up people wanting the same functionality and being told it ain’t possible and articles that suggest messing with config files this to me seems to be a much simpler and nicer way to achieve multiple instances.